After the four hijacked planes crashed on Sept. 11, 2001, the emotional day made front page headlines all over the world. A new Newseum exhibit tries to recapture that. Taylor's daughter, Laura, was only four years old at the time. Recently, Taylor brought her to the Newseum to learn more about the event that changed this country forever. In advance of the 10th anniversary, the FBI has donated special artifacts recovered in the 9/11 attacks and used as evidence. Two engines that the FBI now calls weapons came from the second plane that crashed into the World Trade Center in New York. As investigators searched through the rubble where thousands of people died, they also discovered a suicide note, victims’ cell phones that rang for days after the attack, and a woman’s purse containing her credit cards and ID. 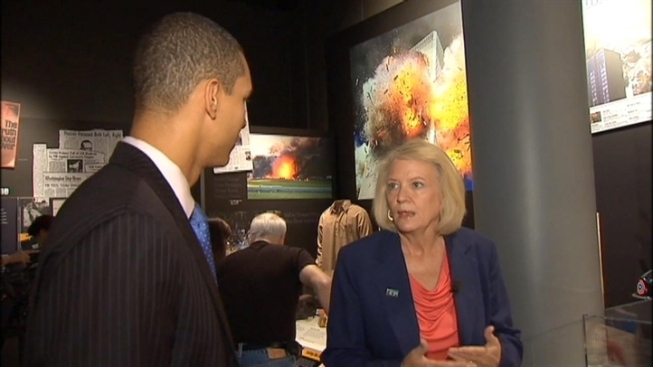 “When you’ve lost someone and you don’t even have the body to bury, it’s so important to have something that belonged to them, and it was another validation that indeed they were on that plane, that they were killed,” said Newseum Senior Vice President of Exhibits Susan Bennett. Through these letters, pictures and other artifacts, the Newseum hopes visitors will never forget the events of 9/11.